Young sailors practice navigating on an obstacle course Wednesday, July 26, on the Dillon Reservoir. 2017 Rocky Mountain USA Junior Olympic Sailing Festival will be held on the reservoir this weekend from the Dillon Marina. This year’s Junior Olympics sailing festival includes up to seven races per day, depending on weather, for sailors between the ages of 10 and 18 years old. Boats range from one-person Laser Radials, Optimists and RS Teras to two-person Club 420s. Spectators can watch for free from the marina or pay $5 for a spectator boat ride. For more info about the festival, see the Dillon Junior Sailing website at DillonJuniorSailing.com. Rudy Burki has come a long way from the days of capsizing and endlessly circling in the shifty, unpredictable waters of Lake Dillon. 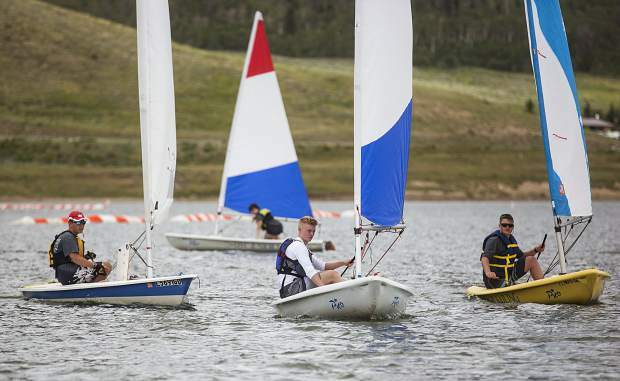 On an overcast July afternoon, the 15-year-old Summit County native was fine-tuning his race strategy with a group of about 10 fellow youth sailors on Summit County’s largest body of water. The kids, part of a three-day Dillon Youth Sailing Race Camp from July 24-26, had been waiting all day for decent wind — a rare problem on a lake considered the “black diamond of sailing,” according to Bob Evans of the Dillon Marina — when, finally, Mother Nature cooperated around 2:30 p.m. Burki and company quickly unmoored from the Dillon Marina and sailed their small, one-person crafts to a pair of buoys dropped by their instructors with Dillon Junior Sailing. These days, Burki is technically a junior instructor, and it shows. He deftly piloted his Laser Radial sailboat through the fray to pull far, far ahead of the other sailing campers, catching a light breeze just right to make the sail taut. The boat seemed to skim over the water, as if it could leave the gently rolling surface and take flight at a moment’s notice. Sailing campers were split between standard learning fleets — Lasers, Optis and RS Teras — and each of the small, single-person craft looked impossibly light compared to larger Catalinas and J-22s. With shoulder-length hair and lanky limbs, Burki looked more like a soccer player (or maybe an alt-rock guitarist) than a sailor, but looks aren’t everything on a sailboat. He’s been at it for most of his life: His first experience sailing on Lake Dillon was at 4 or 5 years old, around the time other kids are learning to ride a bike with training wheels, and he’s been racing in the annual Junior Olympic regattas since 8 years old. When the sailing campers all convened at the start buoys, lead instructor James Welch began guiding them through a standard start sequence for regatta racing: whistles and flags, each with a meaning defined by U.S. Sailing, the sport’s governing body in this part of the world. As Hettinger explained the ins and outs of a good regatta start — sailor positioning, tiller positioning, the subtle direction of the sails in relation to the wind — she pointed to Burki, who she said has “amazing starts.” He knows how to finesse the wind and his craft to catch the right amount of wind, but he also knows how keep his boat on the starboard, or passing, side of the regatta. It’s hard enough to learn the basics of sailing, she continued, let alone the intricacies that separate average regatta racers from elite ones, but the incoming Summit High School sophomore has what it takes to reach that next level. He’s already on his way: At the 2016 Dillon Open Regatta, Lake Dillon’s largest sailboat regatta of the year, he took first overall in the Laser fleet division. This week’s junior race camp lined up with the 2017 Rocky Mountain USA Junior Olympic Sailing Festival, which begins tomorrow and continues through Sunday. The festival features two days of regatta racing with up to seven races per day, Mother Nature permitting, and four fleets: eight Club 420s, eight RS Teras, 10 Laser Radials and the largest fleet, 17 Optimists. More than 50 youth sailors from Utah, Montana and across Colorado are registered for the event, including several two-person crews for the larger Club 420s, also known as C420s. The remaining boats are solo operations, including the Laser Radial Burki will captain. He’s been racing those boats for the past few years and says they’re easily his favorites, much better than the smaller RS Teras. Why? Simple — speed. At this weekend’s regattas, Burki faces some of his stiffest competition in the form of two boys from outside clubs — one from Boulder, another from Montana — who managed to beat him at last year’s Junior Olympic festival. He finished in third place then, but he’s hoping to be just a little better and just a little faster. That’s all it takes in the world of regattas.